The BBVA Compass Visa Business Rewards Credit Card currently has an Informr score of 7 out of 10. This score is based on our evaluation of 2 sources including reviews from users and the web's most trusted critics. 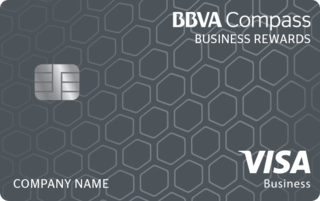 BBVA Compass Visa Business Rewards Credit Card is typically available to those with excellent credit scores (650 or greater). With an affordable interest rate and generous rewards, the BBVA Visa Business Rewards Credit Card card ranks high on our list of business cards. With the BBVA Compass Visa Business Rewards Credit Card, it will allow you to reach your reward goals faster. For example, when you have multiple BBVA Compass cards, you can combine points from the different cards when you desire to reach the rewards you want. Intro. rate can vary from 0-3% depending on your credit. Earn 2X and 3X points when you make purchases in the categories you select. Choose from categories including office supplies, utilities, groceries, gas, travel, and healthcare. Shop with your enrolled Visa Business credit card at participating merchants and save up to 15%.